It came close, but we did it! The Annapolis Flip is complete and we got it listed just before the end of summer. While we don’t have a ton of time to get it sold before Fall, we think the quality will get it sold quick. We learned a lot on this one. We hit a number of speed bumps along the way, but Evan did a great job keeping the budget under control and ensuring that we got over the finish line. If there’s one thing you learn quickly in real estate, it’s how important it is to have a team. 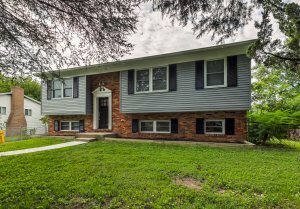 You can click here to see our listing and final pictures. This story begins back in the summer of 2016. We had completed a round of direct mail and the phone calls were starting to roll in. While we now use a full-time call center, at that time all of the calls were being answered by Evan directly. While we wanted to answer every call live, sometimes a call would slip through the cracks and go to voicemail. We also want to treat potential sellers with respect and never solicit past what is reasonable. If someone requests to be removed from our list we always oblige. But this call was different. There wasn’t anything in the voicemail about being removed from the list or never considering another type of offer. We decided that we needed to do our due diligence so Evan gave her a call. Speaking with her over the phone seemed to make all the difference. The homeowner, Barbara, was winding down her real estate dealings. She had been a real estate agent for many years but recent circumstances made it where she wanted to free up time so that she would take care of her elderly mother. Barbara had purchased this property over a decade earlier as an investment property. While it served her well as a fixed income asset, it still required her time to manage it. Even though the current tenants were respectful, they were tough on the property and it required many repairs before being listed. While she was capable of managing the repairs herself, she knew that it would take up significant time she could spend taking care of her mother. After a week of going back and forth we were able to come to an number that we were all happy with. She would be able to walk away from the property with cash and we would honor the remaining months of her tenant’s lease. At this point we decided it would be appropriate to bring the tenant into the loop. This individual was a single mother who had been living in the property for years. While she loved the neighborhood, the house, and the schools, she was looking to downsize into something a little more affordable. In fact, she had already started looking before we had even approached her about the sale of the property. In order to make the transaction as smooth as possible, we wanted to keep the tenant happy. Nothing is worse for a deal than a tenant who believes that are being mistreated. We worked it out where the tenant had an opportunity to break the lease early if she was able to find a place early. Not only that but since we were fully renovating the property for a sale we were able to offer her the entire security deposit with no deduction. This was an extra $1500 in her pocket that she wouldn’t have had if she had simply moved out of the house with all the wear and tear. A true win-win-win for all the parties involved! It had been a long process starting in the summer, but we finally closed in February 2017. Things went smooth with the tenant who quickly found a new, more affordable place to live. Once the house was cleared out we jumped right into demo work. Bathrooms were stripped down to the studs and the kitchen was gutted. Doors, trim, and floors were all removed to create a blank slate in which to modernize the home’s design. No 2017 renovation would be complete without an open concept main floor. The issue was that the kitchen wall was load bearing. While not something we’d recommend for weekend warriors, you can structurally change the way weight is distributed by introducing an LVL (Laminated Veneer Lumber) Beam. This creates a header and allows you to remove the wall without affecting the structural soundness of the home. Additions are great. 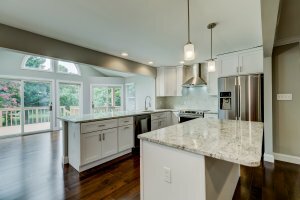 They provide additional space to a home and allow you to create a unique layout that would not be possible otherwise. While more square footage is always a benefit, often times this comes at a cost. Most HVAC systems and duct layouts were designed with only the original home’s schematics in mind. More often than not, additions are built without any real consideration with how they will be heated or cooled. The contractor may have tapped into the main duct trunk but it’s unlikely the system is creating enough force to truly get enough conditioned air to the space. The duct layout at 625 Edwards Rd. was not conducive to properly conditioning the addition, so we found a better solution: a mini split. A mini split works by heating and cooling the air directly in the room. This way the air doesn’t have to be moved to an HVAC system in another part of the house. Enough Work, Time For Some Fun! Once we figured out the technical issues of the house it was onto the fun part: cosmetics! Evan is the mastermind when it comes to making a house pop when you walk through the front door. Typically we start with a paint color. Greige has been our go-to color this year. It’s modern and cool, yet welcoming and trendy. It’s a great complement to white as well as an entire spectrum of blues. When it comes to cabinets we went with a white shaker style. These expand the kitchen and create a space that feels larger than it is. The largest deviation we took with this kitchen was the backsplash. We felt that staggered subway tile felt passe and unimaginative. To add a touch of personality, Evan had the great idea of using a herringbone pattern. We showcased this by utilizing a stainless steel stove vent that allowed us to run the backsplash all the way to the ceiling. For the master bathroom we wanted to do something above and beyond to make the custom shower really stand out. The conclusion was to add a custom glass door. 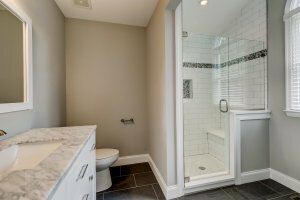 We have installed frameless shower doors in the past, but they came in a kit that was relatively easy to install and ran about $800.The way this was designed with the bench required that a custom installer be called in. These quotes were way higher than we expected! $2400, $2200, even $2600! We eventually found a company that could do the install for $1,900. While not a steal, this was a reasonable price given the other companies’ quotes. While expensive, the results were well worth the money. Whenever we renovate a home we do a final walkthrough where we mark everything that is not perfect. This includes paint touch-up, loose handrails, sticky doors, missing hardware, and anything else that is keeping our good home from being great. We believe that people appreciate perfection and that they notice even the smallest of details. While this takes additional time and effort, we believe it pays off tenfold in ensuring that buyers fight over our listing and contributes to a fast closing. Once touch ups are complete, we schedule a deep cleaning from a professional cleaning company. They really make the home shine. Windows are cleaned, carpets are vacuumed, and bathrooms are scrubbed. By the time they’re done it goes from looking like a work zone to looking like a model home. Photos are always the last thing scheduled. Photos are what a buyer uses to decide whether or not they want to buy your property. A showing is just the opportunity for a person to verify that the photos were accurate so that they can officially pull the trigger. This is why it always amazes us when we see Realtors putting up listings where they clearly took the photos with their phone. 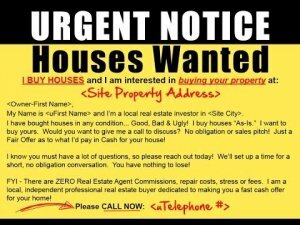 Why cheap out on the one chance to convince a buyer to purchase your client’s home? Pennywise and tom foolish. 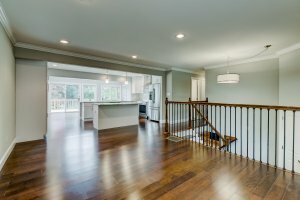 We will only ever list a home using professional photography. Not only that, but we require our photographers to take HDR (high-dynamic-range) photos using a wide-angle lens so that buyers perusing the listing receive the best first impression possible. While it feels good to have the renovation complete, now comes the most stressful part of the project: the listing. Once you’ve posted the listing all you can do is sit back and wait for the showings to be scheduled. The first 2 weeks are when you will get your best shot at all the buyers potentially interested in your home. Now is the time for us to make a deal and move towards the closing table!